Really pleased to welcome YA and NA author Carla Luna Cullen to the blog today, to talk about Enid Blyton's St Clare's series. Name of the Series: The St. Clare’s series, written by Enid Blyton, originally published from 1941- 1945. To round out the series, Pamela Cox wrote three additional books, published after Blyton’s death in 1968: Third Form at St Clare’s, Kitty at St Clare’s, and Sixth Form at St Clare’s. Availability: The books have been available in print for years. Digital versions are also available. Egmont is doing a reissue of the series, complete with modern covers, which will be available in early 2014. 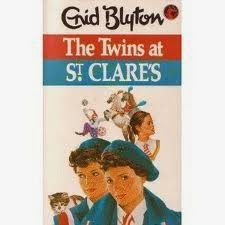 The Premise: Like Blyton’s Malory Towers series, the St. Clare’s series is set at a British boarding school. The main characters are the twins, Pat and Isabel, but the stories contain a large cast of characters, including numerous students and teachers (such as the fair-minded headmistress, Miss Theobald, and the zany, over-the-top French teacher, Mam’zelle). Each book takes place during a school term or school year. In the first book, which sets the stage for the rest of the series, Pat and Isabel are new students at St. Clare’s. For the first half of the book, they act like spoiled, demanding brats, earning the scorn of their fellow students, who call them the “stuck-up” twins. They gradually adjust to St. Clare’s (a “sensible” school) and learn to fit in. By the end of the story, they have come to love St. Clare’s and can’t wait to return after the Christmas break. The other books in the series feature the full cast, but each book spotlights a few characters, often the “new girls” for that term/year (e.g. rich and vain Angela, sad sack Gladys, spiteful Elsie, wannabe poet Anne-Marie, mischievous French student Claudine, and so on). The books tend to be anecdotal in nature, with various crises cropping up and being resolved fairly quickly. Characters who steal, lie, or behave poorly usually get their comeuppance and repent at the end. Why I Really Like It: Growing up in Canada, I read a lot of children’s books written by British authors. I assume it had something to do with being a part of the Commonwealth, because when I lived in India, I also noticed a predominance of British children’s books available in stores and libraries. One of my favorite authors as a child was Enid Blyton, a prolific writer who created various mystery and adventure series. I loved her two boarding school series, Malory Towers and St. Clare’s, because I attended a pseudo-British private school in Canada, complete with prefects, an all-important sports captain, house games, and a “head girl” that everyone worshipped. I deeply regretted that my school, Norfolk House, was a day school rather than a boarding school. Whenever I read Blyton’s books, I fantasized being at one of her schools—sharing secrets, enjoying midnight feasts, and playing pranks on the teachers. The midnight feasts were the best part of the books, with treats like sponge cake, ginger beer, and pork pies (none of which were familiar to me—making them seem even more exotic!). Best Books: My favorite book of the series is the last one, Fifth Formers at St. Clare’s, because the girls are older. As fifth-formers, they were paired up; each pair got their own private study, with furnishings and a fireplace, where they could have cozy afternoon tea. Who it Will Appeal to: This series is almost seventy years old, so the writing has a somewhat stilted feel. Although I enjoyed these books immensely as a child, when I tried to re-read them now, I was more critical. Many of the characters are depicted one-dimensionally, with the same adjectives cropping up again and again: feather-headed Alison, strapping Mirabel, fat Alma Pudden (“Pudding”), and Carlotta, the wild Spanish girl (described more than once as “dark as a gypsy”). Blyton is a truly omniscient narrator, flitting in and out of the girls’ (and teachers’) heads at will. Exclamation points are liberally used, in dialogue and description. Despite being put off by the writing style, once I started reading these books again, I felt that familiar longing for boarding school life. I was also sucked back into the mini-dramas that played out in each book (and there were a lot of them!). Overall, they’re a fun read, ideal for kids at an elementary school reading level (Grades 1 – 4). Others By the Same Author: Enid Blyton wrote an astounding number of children’s books in her lifetime, most of which were grouped into series. In addition to the two boarding school series, some of her series include: the Famous Five, the Secret Seven, the Barney Mysteries, the Naughtiest Girl, and the Noddy books. A huge thanks to Carla Luna Cullen for this great piece - which makes me want to dig out my copies and reread! She can be found at her website and on Twitter. I remember loving these! I was obsessed with boarding school books, like so many other kids. completing simple surveys from home.